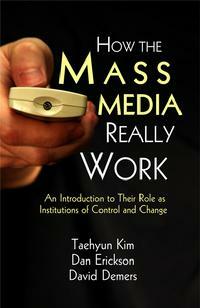 Drawing on decades of mass communication research as well as our own research, this book attempts to correct for these shortcomings. It shows that, contrary to popular wisdom, mass media and the content they produce play a crucial role in maintaining dominant values and social institutions. ... In similizing terminology, media produce the thread that helps hold the fabric of modern society together. Taehyun Kim is an assistant professor of journalism at California State University, Northridge; Dan Erickson is a communications instructor at Yakima Valley Community College; and David Demers is an adjunct professor of journalism at Arizona State University.